Want To Control Problem Sweat Using Iontophoresis? 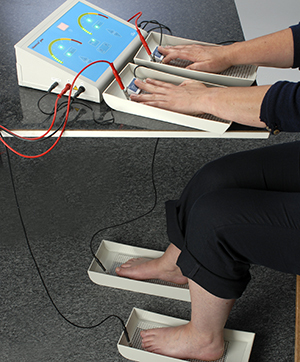 Iontophoresis is a way to reduce excessive sweating on the hands and feet. Our experienced practitioners offer expert knowledge and advice on getting to know your iontophoresis machine and will support you through your first treatment and help you purchase your own device for regular use at home. Iontophoresis uses water to conduct a mild electrical current through the skin's surface to interrupt sweat production. It is thought that the electric current reacts with the mineral particles in the water to thicken the outer layer of the skin and block the flow of sweat to the surface. The effects are temporary. During iontophoresis, the affected area is placed in water for 20 to 30 minutes. There is no pain, but it may cause skin irritation and some discomfort. How it actually works to reduce sweating is not certain, but it is thought to block the sweat pores. At first, you will need to use your machine two to four times a week, then you will need regular sessions at one to four week intervals, as necessary. Iontophoresis is relatively convenient if you purchase your own iontophoresis machine, as you are able to manage your sessions in your own time and do not need to head to your clinic or GP. These sessions need to be continued on a regular basis otherwise excess sweating will return. You might also find it useful to compare the cost of iontophoresis with the cost you are spending on current treatments. Click here to use our sweat cost calculator.